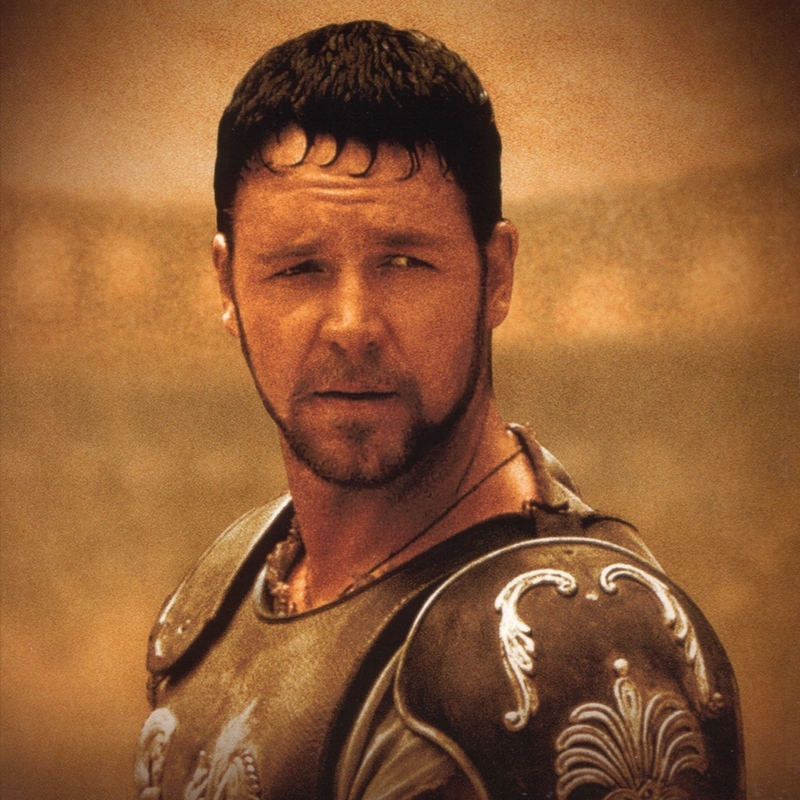 In the movie Gladiator, Russell Crowe plays the role of Maximus, son of Emperor Marcus Aurelius. Maximus’ life is relegated to fighting for his life as a gladiator after Commodus takes power and strips Maximus of his general officer rank. By several historical accounts, however, Maximus, as portrayed in the movie, is largely fictitious and a composite of several individuals. But Emperor Marcus Aurelius is real and died in 180 AD in a Roman camp in modern-day Vienna, Austria which is about an hour and a half from my apartment in Krems. Roman influence is still sometimes felt throughout the region. Last weekend I went to Tulln (a past Roman settlement) and was reminded of the Roman influence as modern-day gladiators with Maximus’ desire, determination, and dedication competed. More about that later. Tulln is located on the right bank of the Danube River between Krems and Vienna and I have journeyed by train there three times in the past couple months. Tulln was settled well before the Romans arrived over 2000 years ago. The Roman Empire had an outpost in present-day Tulln and the Danube at one time was a boundary for the Empire. 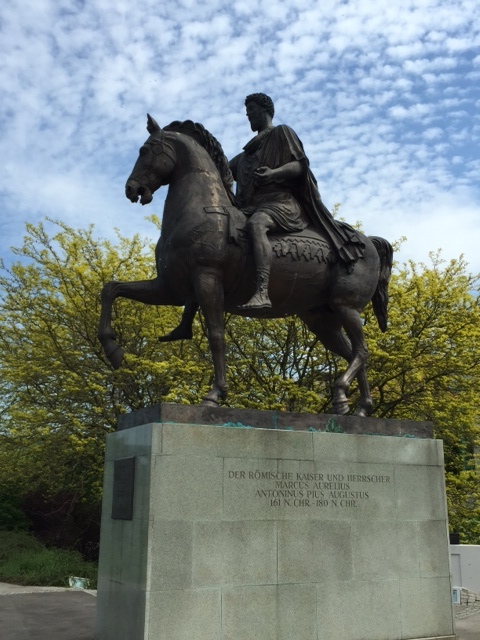 Near the Danube, in the area where the Roman fort was located, is a statue of Emperor Marcus Aurelius and an excellent museum with artifacts and items attributed to Tulln’s Roman past. There are few visible, physical remnants of the town’s Roman-period existence except those excavated and now preserved in the museum. I certainly enjoy visiting such historic places like Tulln and museums dedicated to their history. This museum is especially good with numerous artifacts and explanations of them. But on my post-retirement adventure in Europe I also crave several things that are simply American like pancakes with real maple syrup, eating hamburgers with real beef (think about that for a minute and you will understand), and so on…. One such craving is my passion for American football. 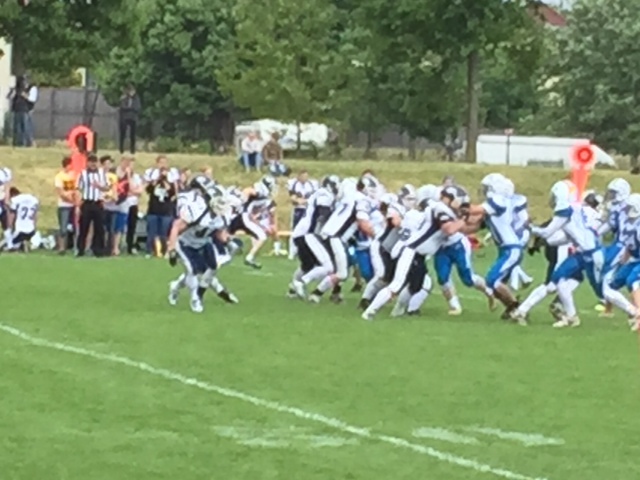 That is what lured me last weekend to Tulln to see modern-day gladiators with the Tulln Air Force Hawks competing against the Blue Hawks from Asperhofen in a real American football game! It is wonderful that here in the middle of Europe I can experience watching the game I enjoy and witness things that have been incorporated into the game day. American football in this area is what Americans would call a “club sport.” The players come from all over Lower Austria and are playing for the love of American football. Where football (soccer) is king, these gridsters may eye being discovered for an opportunity to play on an American college football team or may envision a professional career as the NFL in Europe gains traction. Regardless, they are modern-day gladiators. The announcer spoke in German and added color in English like “Oh my God, quarterback sack!” Each team’s starting players ran onto the gridiron through “smoke” out of a large inflatable helmet as their names were announced. The officials marched onto the field (although out of step) and there was real respect for them. 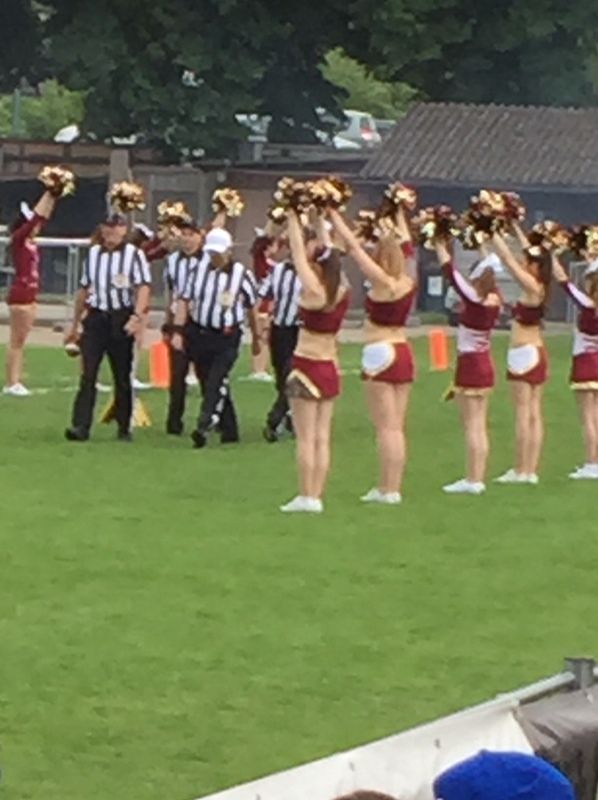 There were cheerleaders too! They came from the Vienna Wildcats and cheered for the Tulln Air Force team. There was a lot of fan noise throughout the game with horns, drums, clappers and other devices to support their hometown team! Noise was unending and only stopped at halftime and during injury time-outs. About 300 faithful fans attended. There was no halftime show and I observed that halftime was like a social outing among friends. On the initial kick-off a player was injured. Every player on the manicured grass field and sidelines and every cheerleader went on a knee for this and each time a player was injured. I thought it to be respectful and almost like they were jointly sending a prayer that the injury not be serious. The food at the concession stand was interesting. Remember, this is Austria. The choices on the chalk menu were grilled frankfurters, grilled hamburgers (see note above), and, of course, grilled pork. Beer, wine and Coke were also sold along with cigarettes which were permitted to be smoked anywhere other than in the bleacher area. Finally, Tulln’s gridsters just didn’t have an adequate passing quarterback and lacked a punter so they ran on every fourth down (including a 4th and 20 from their own 20!). Asperhofen’s Blue Hawks had a dominating defense and at the end, the hometown gladiators lost the contest. However, I give them and the game a “thumbs up” as each of the modern-day gladiators, the fans, and I enjoyed the day of American football.